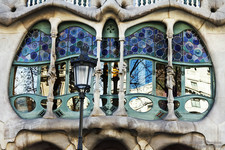 Casa Batllo tickets - skip the line! It is said that the rooftop of the Casa Batlló is a sleeping, colourful dragon, one that receives almost a million visitors a year. 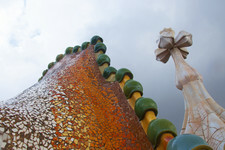 Together with the one in the Park Guell, the Casa Batlló hosts the most famous dragon of the city of Barcelona! Once you get your Casa Batlló online tickets and thus visit this monument, you will be in front of an incredibly detailed universe of symbolism. The greatness of Antoni Gaudí can be found in his work, so imprinted in the essence of the city of Barcelona. Keep reading to discover all about the Casa Batlló! The casa Batlló is located in the district of L'Eixample, a whole district that was projected in the middle of the 19th century in order to form the city of Barcelona as we know it today. Did you know that before the Eixample was built, Barcelona was only formed by the old town and the neighbourhoods that were closest to the sea, like Poblenou and Sants-Montjuic, among others? The charming upper neighbourhoods of Barcelona, such as Horta, Gràcia or Sarrià, were independent townships and not a part of the city. But then, L'Eixample was planned and built, and it quickly became one of the most important arteries of the city. The road that communicated Gràcia with Barcelona became Passeig de Gràcia, the most elegant and expensive avenue of the city, and the Catalan bourgeoisie bought many of the properties located there. A common practice by the owners of the building was then commission a new façade or building, and they hired an architect to do so, the best one they could afford. The bourgeois family would then name their building after them, and those names are still used today. This is why nowadays we talk about the Casa Amatller, the Casa Milà (better known as La Pedrera)... Or the Casa Batlló itself! The Casa Batlló was designed by Antoni Gaudí, and built between 1904 and 1906. Although, did you know that it wasn't really built then? 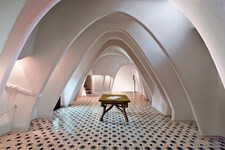 In fact, the Casa Batlló was a remodelling of an already existing house from 1875. When textile businessman Josep Batlló i Casanovas bought the building in 1903, he had planned to demolish it. However, he finally decided to just remodel it and stablish his private residence there - the rest of the apartments would be for rent. He hired the already renowned architect Antoni Gaudí, who was already working in his masterpiece, the Sagrada Familia. That didn't make the project of the Casa Batllo any less ambitious, though: Gaudí made several changes to find the best structural solution to any problem, and put all his creative genius in the work. 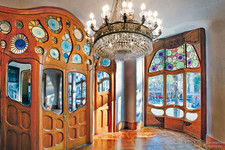 The Casa Batllo is still a private property nowadays. In 1993 was bought by the Bernat family, owners of the Chupa Chups company, who restored it and opened it to the public. 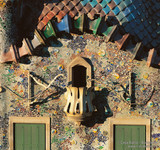 In 2005, the UNESCO declared it as a World Heritage Site, as many other works by Gaudí. As any artist does, Antoni Gaudí went through different periods throughout his career. 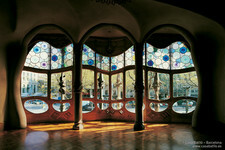 The Casa Batlló is the height of his naturalistic period, when he perfectioned his unique style and dove in Catalan Modernisme. In what constitutes a characteristic trait of this architectural style, Gaudí found inspiration in nature to design the Casa Batlló, and studied geometry deeply to incorporate it to his designs. Even if the detail and the originality of the building may suggest otherwise, functionality was still essential to Gaudí, and all the elements of the Casa Batlló depended on it. But, of course, the impressive façade will catch your eye and make you forget about the functionality. Some say that the house is inspired in Carnival, since the balconies look like Carnival masks, but if we stay on the dragon metaphor, you can see the resemblance to bones of the irregular and beautiful pillars - it is said that those pillars where a symbol of the victims of the dragon. The walls are full of colours and show Gaudí's famous technique of the trencadís, broken pieces of tiles and glass in many colours, perfect in their chaos. The façade is reminiscent of sea waves of the Mediterranean Sea, and of the mountain of Montserrat and its sinuous shapes. The interior of the Casa Batlló is equally impressive. There is an inside patio in blue tiles, irregularly shaped furniture, spiralling ceilings and astonishing rooms. Finally, you will find the roof, the sleeping dragon, with its multicolour reptile-skin-like tiles and its unique chimneys. All in all, you're not likely to forget the many colours and shapes that make the Casa Batlló one of the most original houses in the world. Now that you've learnt so much about this unique monument, are you ready to get your Casa Batlló online tickets with GowithOh? There is always a very long queue in front of this Gaudí house, so we recommend getting your tickets in advance. There are different Casa Batlló online tickets that you can get, so you can choose the one that you like best! The Casa Batlló online tickets will allow you to climb to the roof and visit the show rooms inside the house, which are as impressive as the façade. You will visit the entrance hall, inspired in the submarine routes of Captain nemo, where you will be able to spot turtle shells and other sea-inspired elements. 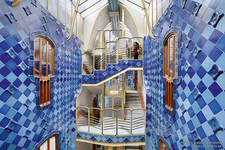 Then, you can climb up the majestic stairs and visit the romantic noble floor and the impressive modernist courtyard, where you will be able to admire Gaudí's trencadís technique, with the broken colourful tiles. Finally, you will see the attic and get inside the dragon's belly at the terrace. 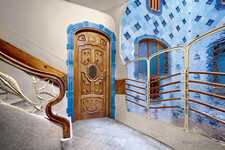 The different Casa Batlló online tickets all include a complete visit, that you can complement with an audio guide, but you can benefit from special features for an extra fee. There is a Casa Batlló online tickets with FastPass, or with an open date, and another one that includes an evening toast on the dragon rooftop. There is also the wake up call Casa Batlló online tickets, as well as the fun theatrical visits, the perfect option if you're travelling with children! The Casa Batlló online tickets range from 23 to around 35 euros depending on the kind you get. The house is open every day of the year. The Casa Batlló is located right next to the metro and train station Passeig de Gràcia, which will prove very convenient to move around the city after you enjoy your Casa Batlló online tickets. There, you will access L2 (purple), which can take you to Sagrada Familia or the neighbourhood of Sant Antoni; L4 (yellow), which will communicate you with the seaside and all the beaches of the city; and L3 (green), which can take you to the city centre, the Park Güell or Montjuic. Besides, the train line that stops in Passeig de Gràcia can take you to some beautiful beach towns like Sitges, which can make a great day-trip! Regarding the metro, we recommend you to use the entrance next to Casa Batlló if you want to take L3, but not if you need to go to L2 or L4. Did you know that the underground passage that communicates L2 and L4 with L3 is the most hated transfer passage by the locals in the city? You will have to cross the whole Passeig de Gràcia anyway, so we recommend you to walk down the street until you get to the entrances close to Gran Via de les Corts Catalanes - this way you can enjoy the beautiful surroundings of the Casa Batlló! Remember that here at Oh-Barcelona, our goal is for you to have an unforgettable experience. Besides getting your Casa Batlló online tickets, in our site you will also be able to find the best apartment deals near the Casa Batlló, Passeig de Gràcia, or any major point of interest in the city, as well as insightful recommendations for the area of the city where you're staying. You will find the best of Barcelona with Oh-Barcelona! The Casa Batlló is located in what is known as the 'Illa de la Discòrdia', which can be translated to English as the Block of Discord. As we've explained before, bourgeois families acquired buildings in L'Eixample to stablish their private residences there and, of course, the richest ones could afford the elegant Passeig de Gràcia and the most renowned architects to remodel them. In the block of houses where the Casa Batllo is located, you will find other houses of great architectural value that were built around the same time, all of them by very well-known Modernist architects of that time. There was a certain professional rivalry between those architects, so the story says that they were competing to see which of them would design the most beautiful house. The city of Barcelona was the real winner, of course, since its patrimony gained monuments of incredible value, but a fun activity can be to explore all the houses of the 'discord' to see which one is your favourite - we must say, the Casa Batlló has lots of chances of winning! Right next to the Casa Batlló, which is located in number 43, you will find Josep Puig i Cadafalch's Casa Amatller, easily recognisable due to its inspiration the architecture typical from Amsterdam and Brussels. In number 37, you will see Enric Sagnier's Casa Mulleras, and in the next corner, in number 35, a beautiful pink palace designed by Lluís Domènech i Montaner and known as the Casa Lleó Morera. 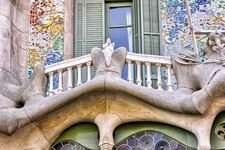 But there's more than the Block of Discord in the surroundings of the Casa Batlló. Passeig de Gràcia is full of houses of Modernist style, and you will sure like walking along it and admiring them. Don't forget that if you go towards the mountain, you will find another of Antoni Gaudí's masterpieces, La Pedrera! Another thing that you can do around Passeig de Gràcia is... Shopping! It is the main shopping avenue in the city, and you will find fashion for the likes of all sorts of pockets: From H&M to Prada. And let's not forget what made Passeig de Gràcia so appealing for the Catalan bourgeoisie of the early 20th century: its privileged location! South of the Casa Batlló, you will find Barcelona's old town, so after making the most out of your Casa Batlló online tickets you can explore Las Ramblas or the beautiful Gothic Quarter. What are you waiting for? 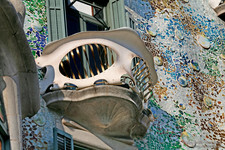 Get your Casa Batlló online tickets with Oh-Barcelona and start enjoying your Barcelona experience!